Double Day is my own trading strategy. It only works on EUR/USD. While monitoring this pair, I found a certain pattern, and decided to develop an Expert Advisor in order to check the pattern on history. It turned out that the pattern had been working for already two years. 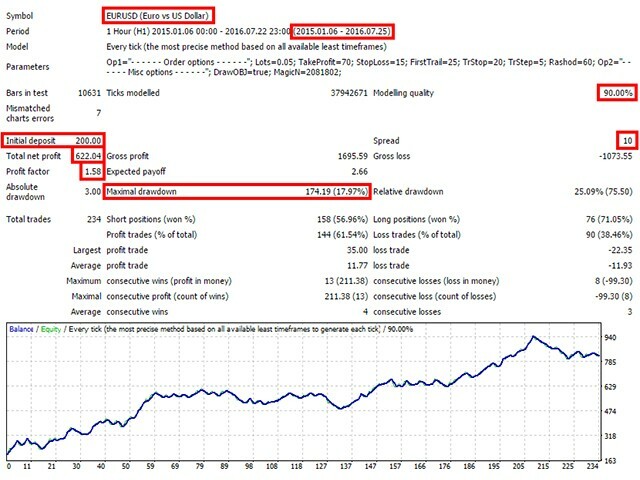 I cannot unveil its essence, I can only say that it is a trend trading system that does not use any indicators. The entry point is determined after the closure of a daily candlestick, therefor in order for the EA to work accurately, your terminal must be turned on at 00:00, and it is even better if it is running 24/7. In order to avoid errors, I have restricted EA operation on other currency pairs. It can only work on EURUSD. 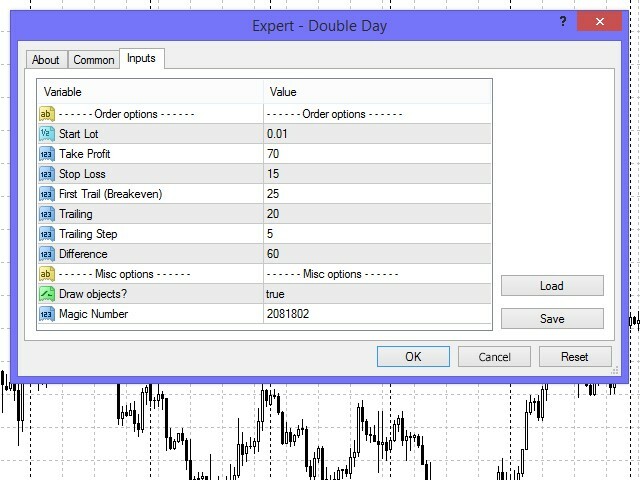 The Expert Advisor is based on the Safe rule: it opens two orders at a time, order has a Take Profit equal to its Stop Loss, and the other one has a Take Profit specified in settings. The EA has a Trailing Stop function. 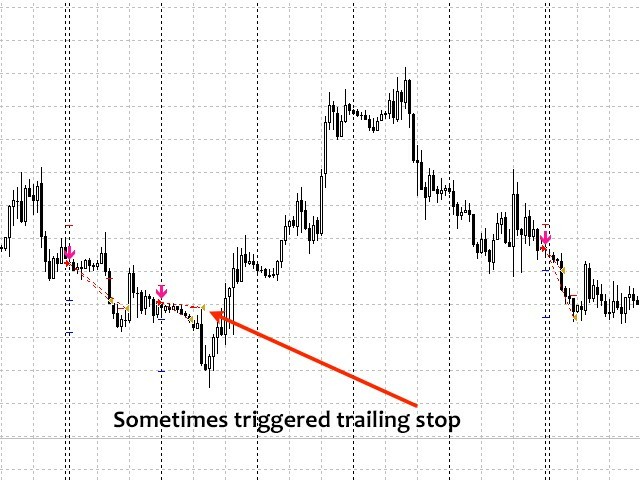 If you want to disable the function, set First Trail and/or Trailing Stop greater than Take Profit. Start Lot - the EA opens two trades at a time of the specified volume. Take Profit - the EA's Take Profit value. Stop Loss - the EA's Stop Loss value. First Trail (Breakeven) - moving an order to breakeven. Difference - a risk parameter. The lower the value, the less entry points the EA has with a higher success rate, and vice versa. Draw Objects? 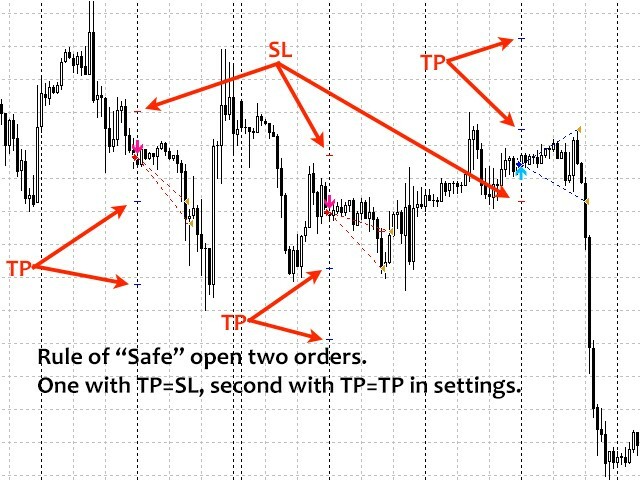 - show/hide entry points on the chart. Magic Number - Expert Advisor ID. The Expert Advisor's default settings are the most optimal ones.